Introduction: Edward O.W. Whitehouse, “Wildman Whitehouse” as he generally styled himself, was a surgeon by profession and an electrical experimenter by avocation. In 1856 he was appointed Electrician to the Atlantic Telegraph Company and was responsible for the testing of the 1857/58 cables, and for the design and operation of the equipment which would transmit the telegraph signals between Ireland and Newfoundland. While there were other factors, the historical record generally reports that Whitehouse’s insistence on using high voltage induction coils was ultimately responsible for the failure of the cable. In this article, first published in History of Technology in 1985 and reproduced here by kind permission of the author, Donard de Cogan presents a somewhat different view. The author has added a 2009 postscript with further information on the Halpin cable. History of Technology, Vol. 10, 1985, pp. 1-15. The first successful telegraph cable across the Atlantic was laid in 1858 and lasted little more than one month. Its history has been well documented by authors in both Britain and America. Henry Field, the brother of one of the prime movers, wrote the first serious account. More recently, Bern Dibner  and Arthur C. Clarke  have written popular versions from an American point of view. Sylvanus P. Thompson’s biography of William Thomson (Lord Kelvin)  contains several well-documented chapters on the subject and has been a major source for much of the background material presented here. On the other hand, John Merrett’s popular account  is perhaps as close as one can get to the scene of the original action. During the present century he worked at the Valentia Cable Station in Ireland and in his book he makes much use of the memories of some of the original operators (graffers). All previous histories appear to be agreed that the 1858 cable was destroyed by the actions of Dr E.O.W. Whitehouse who applied very large voltages to it in an attempt to drive his patent recording telegraph. A section of this cable has recently been discovered in private ownership in Ireland. The results of a detailed examination indicate that Whitehouse’s action merely accelerated a process of failure which was inevitable due to faults induced in the cable during manufacture and subsequent handling. And thus in this paper it is suggested that the history of the 1858 trans-Atlantic cable and its premature failure needs to be re-examined. When the first proposals were made for an Atlantic telegraph, it was not clear whether electrical signals were capable of travelling over very large distances. Doubts were much reduced following an experimental demonstration by Charles Tilston Bright and Edward Orange Wildman Whitehouse, a surgeon who in 1856 had given up a successful practice in order to devote his time to the science of electricity. Bright was chief engineer of the Magnetic Telegraph Co. and used his position to arrange a link-up of over 2,000 miles of underground cables. A satisfactory rate of transmission was reported. Encouraged by this demonstration, the Atlantic Telegraph Company was formed in 1856. William Thomson (later Lord Kelvin) was one of its directors, having been appointed by the Scottish shareholders. Thomson had been applying Fourier analysis to the problem of retardation of signals in long-distance telegraphs, and had postulated that the resistance depended on the cross-sectional area of the conductor (as well as its purity) and that the capacitance could be reduced by increasing its diameter. This law of squares was vigorously challenged by Whitehouse, whose theory of electrical propagation could be described in a few words as: ‘the further that electricity has to travel, the larger the kick it needs to send it on its way’. However, on account of his association with Charles Bright, Whitehouse was appointed company electrician. Thomson, on the other hand. in spite of his growing reputation, held no technical position within the company. The first moves to establish the Atlantic telegraph had been made in America where there was already a telegraph from New York to Newfoundland. Now the investors on the American side of the venture were pressing for quick results. Even before the first meeting of the Atlantic Company’s directors, the provisional committee which registered the company had placed orders for cable of light core in accordance with Whitehouse’s specification. Thomson advocated a heavier cable and was insistent about the need for highest purity copper but it was too late. The cable, half of it manufactured by Glass Elliot & Co. of London and the other half by R.S. Newall of Birkenhead, was to be delivered within six months. Delivery was in fact completed on 6 July 1857. An attempt was made to lay the cable during the summer of 1857, but it proved unsuccessful on account of the severity of the braking system which controlled the rate of payout from the ships. The cable squadron returned to Plymouth determined to try again the following year. The Admiralty acceded to a request for storage space for the winter and made available a vacant powder magazine at Keyham dock. Wooden huts were erected at company expense to house the cable, which was passed through a mixture of tar, linseed oil, pitch and beeswax during transfer from the ships. This treatment (according to official reports to the board) was for the effectual preservation of the cable from atmospheric influence during the winter. This confirms that the treated cable was stored in the atmosphere and not under water. Some time after 1858 it was recognized that the insulator, gutta percha, which was used in the cable degrades by an oxidation process during prolonged exposure in air. Following this discovery, the industry adopted the practice of cable storage under water. During April 1858 the directors received disquieting reports about the condition of the stored cable. Numerous defects had to be cut out as the cable was being coiled on board the ships. The reports to the board of directors do not give details about the nature of these defects. The expedition of 1858 was to follow Charles Bright’s original scheme: two ships were to meet in mid-ocean and pay out cable in opposite directions (to Newfoundland and Ireland). Following a successful trial of the plan in the deep waters of the Bay of Biscay, the ships and their escorts sailed in June. 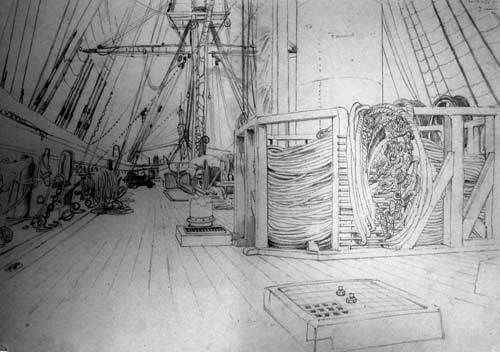 Thomson travelled on HMS Agamemnon, which encountered a terrible storm lasting four days and during which time the cable suffered damage. It took two days to uncoil and recoil the tangled section, nearly 100 miles of cable (see Fig. 1) The ships met as planned and following a number of unsuccessful starts Agamemnon sailed into Valentia Bay in south-west Ireland on 5 August. The Niagara arrived in Newfoundland at about the same time. The directors had been so uncertain about the likelihood of success that no provision had been made for the laying of shore ends. As a temporary expedient, deep-sea cable was landed. Figure 1. Cable on Agamemnon’s deck. From the Cooke collection of drawings in the IEE Archives. Whitehouse had remained on shore during the expedition: medical reasons (not for the first time in this history) apparently prevented him from sailing with the ships. The cable was handed over to him at Valentia on the day of landing whereupon he replaced Thomson’s marine galvanometers which had worked superbly during the voyage by his own heavy relays and induction coils. He was left undisturbed during the next week to adjust the equipment for optimum operation. Very weak test signals crossed the ocean but were insufficient for reliable working and the rate of transmission was very low. Larger powers (from batteries and induction coils) were used in a vain effort to provide enough current through the cable to activate the relays in his printing apparatus. 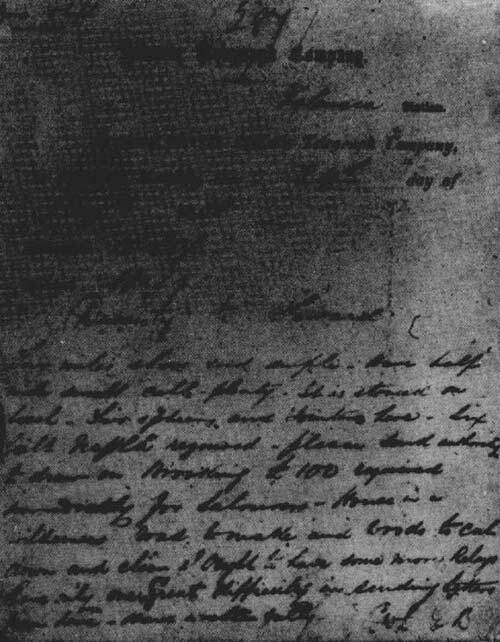 Eventually, on 13 August, Thomson’s mirror galvanometer and Daniell cells were reinserted into the circuit and messages of congratulations passed across the ocean. The message from Queen Victoria to the American President took sixteen and a half hours to transmit because no one had informed Newfoundland that the instruments had been exchanged. 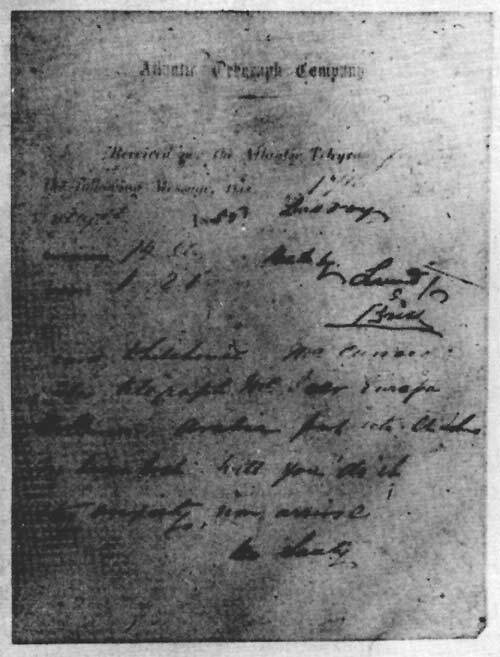 The same message, on being repeated to Valentia for verification, took only sixty-seven minutes to read. Before Thomson returned to his university responsibilities in Glasgow, Whitehouse suggested to him that the difficulties might be associated with a fault in the cable about two miles out. Thomson disagreed, saying that he believed there to be a small fault at a distance of 300 miles from Valentia. During the laying of the cable there had been a temporary loss of contact due to an apparent dead short. Against company orders Whitehouse, persisting with his theory, raised a length of inshore cable looking for his fault. Nothing was found. Immediately this news reached London, Whitehouse was relieved of his post and Thomson was asked to take over. By that time, however, the damage had been done. The dc working potential used by Whitehouse was approximately 500 volts; it was estimated that the induction coils produced about 2,000 volts. Tests carried out by Cromwell Varley as consultant electrician confirmed that there was a fault some 250 miles west of Ireland. However, by means of Thomson’s mirror galvanometer, communications were maintained for some time, although the number of cells necessary for intelligible signal levels had to be successively increased. The total number of messages amounted to 480 on 1 September, when all effective communication ceased. Charles Bright  reports that a few more words were transmitted at intervals up to 20 October by which time a total of 732 messages had been conveyed (see Figs 2 and 3). (ii) D. & C. McIver was Cunard’s agent in Liverpool. (i) Brooking was the Atlantic Telegraph Company’s agent in St Johns, Newfoundland. (ii) It was subsequently stated by Willoughby Smith that naphtha was a most unsuitable solvent for jointing gutta percha cables. According to Captain Brine’s map  (Fig. 4), the original heavy shore end cable of 1857 had been landed at White Strand on the Irish mainland, where a tent and later a cable hut had been erected (see Figs 5 and 6). The 1858 cable had been landed at Knightstown, Valentia, where Whitehouse was enjoying the hospitality of the local landlord (Sir Peter Fitzgerald, Knight of Kerry) while the ships were at sea. Figure 5. 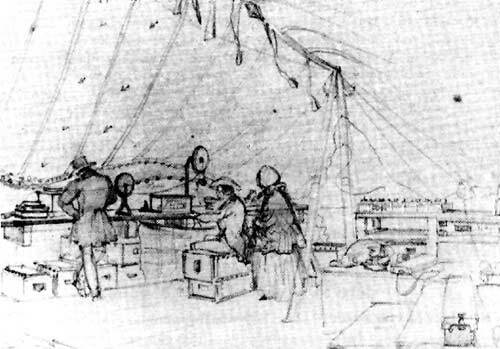 View of tent which temporarily housed the telegraph equipment on White Strand. From the Cooke collection of drawings in the IEE [now IET] Archives. Captain Brine’s map indicates that the tent was pitched by officers and crew of HMS Advice at 4 pm on 1 August 1857. Figure 6. View of iron hut, 40 x 20 ft on White Strand which, according to Brine’s map, was to be permanent offices for the Atlantic Telegraph Company and the British and Irish Magnetic Telegraph Company (who owned the land-lines). From the Cooke collection of drawings in the IEE [now IET] Archives. Recently, while on a visit to Ireland, I was fortunate to discover a section of 1858 cable which had been raised from the ocean (see Fig. 7). Little is known about its history except that it once belonged to Captain Robert Halpin who was First Officer on the Great Eastern during her 1865/6 cable-laying expeditions. He subsequently took over as captain when Sir James Anderson retired and he held that position for the duration of the ship’s cable-laying life. His entire collection was donated by his family to the Irish National Maritime Museum at Dun Laoghaire, Co. Dublin. This includes a model of the Great Eastern as she was when adapted for cable-laying. The section of the cable shown in Fig. 7 has remained in private hands. Figure 7. View of Halpin cable. The right-hand lay of the outer serving of iron wires, which can be seen in places where the marine deposits have broken away, confirms that it is part of the section which was manufactured by R.S. Newall of Birkenhead. This formed the bulk of the cable carried westward by the USS Niagara. The most striking feature about this section of cable is the fact that the copper conductor does not lie coaxially. 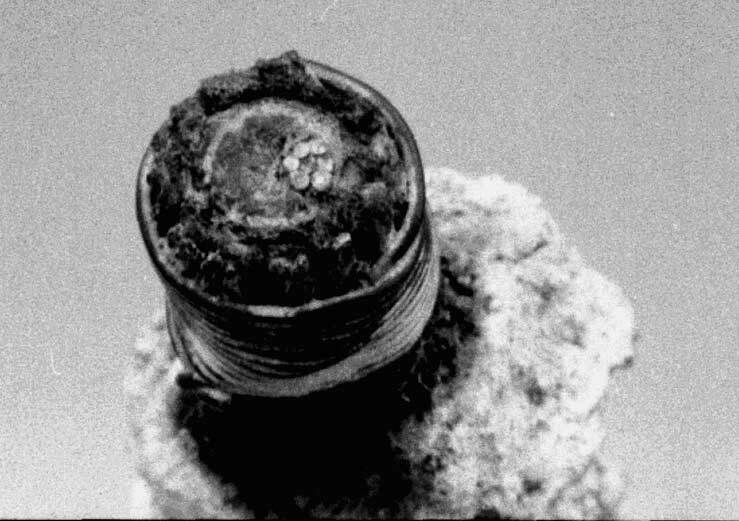 Corrosion and damage have exposed the core in the middle of the sample so that its position can be monitored in four places. In the worst case, the strands come within less than a millimetre of the outer extremity of the gutta percha insulation (Fig. 8). Figure 8. End views of Halpin cable. There are a number of ways in which this could have occurred. Damage after recovery is unlikely: it has been well cared for and shows no signs of maltreatment. An examination of a small section of 1858 cable which forms part of the telecommunications exhibition at the Science Museum in South Kensington confirms that its central conductor is also slightly eccentric. The extrusion of gutta percha during manufacture could have been defective, but there are no reports of this having happened. There are, however, other possible explanations. It must be remembered that the practice of storing cable under water had not yet been instituted; indeed, there is a contemporary picture in the Illustrated London News which shows cable being stored in the open immediately after manufacture, so that softening of the insulator in strong sunshine is one possibility. Alternatively, in an enclosed atmosphere such as might prevail in a ship’s hold, the gutta percha (which was far from pure) could have been affected by bacterial fermentation. This phenomenon is particularly prevalent at moderate humidity levels and it is known that in materials such as damp hay it can lead to significant localized heating or even spontaneous combustion. Perhaps the ‘disquieting reports from Keyham’ could have been due to this cause. On the basis of this theory it is suggested that the failure of the cable was due largely to inherent defects rather than Whitehouse’s misguided use of excessive potentials. High-purity gutta percha has a dielectric strength of 200-300 kV/cm. [16, 17] The gutta percha of 1857/8 was unlikely to have had anything like that strength. It was, however, sufficient to withstand 2,000 volts, confirmed by the fact that the cable in the vicinity of Knightstown, where dielectric attenuation would have been minimal, was found to be perfect when it was raised by Captain Kell and returned to London for inspection. 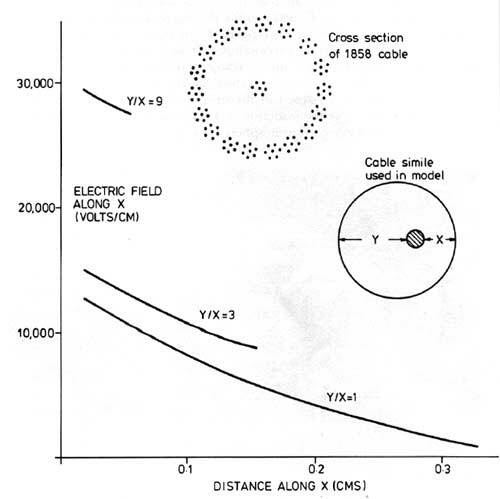 In order to test this hypothesis, a simple computer model of an eccentric cable was constructed. Two circular conductors with similar dimensions to the 1857/8 cable were modelled. The inner one was held at 2,000 volts and the outer one at zero. The intervening space was divided into a square mesh and the electric fields were solved numerically for different eccentricities. The results, shown in Fig. 9, indicate that even moderate deviations produce only small changes in field. In the extreme, however, the situation alters significantly. In this model there is a 130 per cent increase in maximum field when the two conductors come within 1.27 mm of each other. This is equivalent to the situation where the core is very close to the hemp that lies between the insulator and the outer serving of iron wire. With the quality of gutta percha available at the time, it would not have been long before such a condition would have led to dielectric breakdown. Figure 9. Graph of electric field versus position within the insulator for different inner conductor eccentricities. Calculated using the method of successive relaxation. This simple, coarse-mesh approach ignores the actual form of the copper conductor which was used. The arrangement of seven wires (see detail in Fig. 9) would have resulted in six radial high-field points. The treatment has also ignored the independent presence of the hemp, which would have been a relatively poor insulator compared with gutta percha and would have been even less able to withstand high electric fields. Provided the defects mentioned in the reports at the time were in fact of this type, and the treatment subsequent to manufacture suggests that they must have been, then dielectric breakdown of the cable was inevitable. It is not clear how long an extremely eccentric cable would have survived had it been subjected only to William Thomson’s milder regime of a single Daniell cell used in connection with his marine galvanometer. Whitehouse’s treatment was the ultimate in destructive testing of the new technology. Perhaps it was fortunate that he became the scapegoat. If communication had ceased without some obvious explanation as to its cause, then it is likely that the finance which led to the eventual achievements in trans-oceanic telegraphy might have been a little less forthcoming. Whitehouse died on 26 January 1890 at the age of 73. His last involvement with submarine telegraphy had been in 1861, when he acted as consultant to Glass Elliot & Company on the Malta-Alexandria cable. I would like to thank the owners of the Halpin cable for permitting it to be photographed; R.M. Foden of the Malaysian Rubber Producers Research Association for providing me with references 16 and 17; the Institution of Electrical Engineers for permission to include drawings from the Cooke Collection; and the British Library for permission to reproduce Captain Brine’s map. 1. H. M. Field, History of the Atlantic Telegraph, New York, 1865. 2. Bern Dibner, The Atlantic Cable, Blaisdell Publications, New York, 1964. 3. Arthur C. Clarke, Voice Across the Sea, Frederick Muller, London, 1958. 4. Sylvanus P. Thompson, The Life of Lord Kelvin, Macmillan, London, 1910. 5. John Merrett, Three Miles Deep, Hamish Hamilton, London, 1958. 6. Whitehouse obituary, Electrician, 31 Jan. 1890, p. 319. 7. Sylvanus P. Thompson, as note 4, p. 329. 8. Report of the Directors of the Atlantic Telegraph Co. to the Ordinary General Meeting, 8 Feb. 1858. 9. Sylvanus P. Thompson, as note 4, pp. 353 and 356. 10. Charles Bright, Submarine Telegraphs. 11. 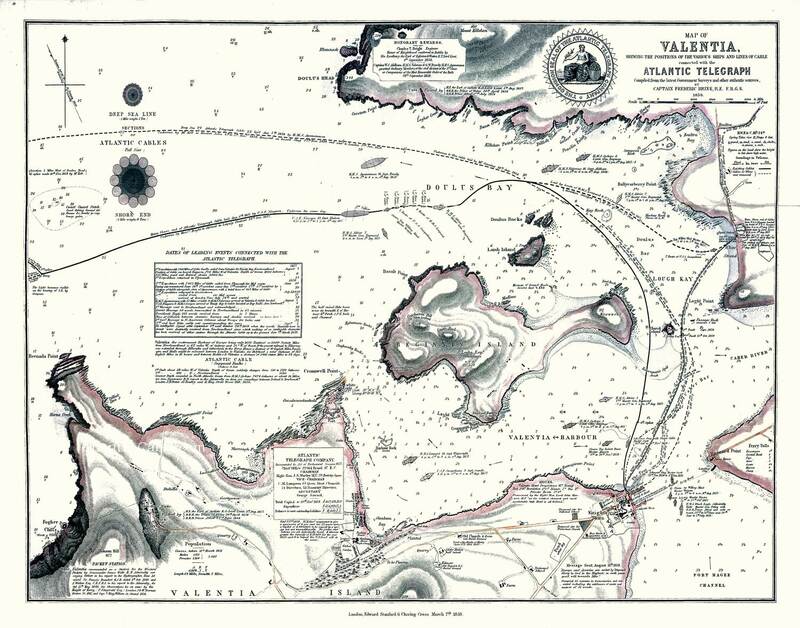 Captain Brine’s map of Valentia contains exact chronological details of events up to the end of 1858. Prior to its discovery by the author in the British Library it does not appear to have been previously used in any serious history of the 1857/8 cables. 12. Report of the Directors of the Atlantic Telegraph Company to the Extraordinary General Meeting, 15 Dec. 1858. 13. Entry of 15/7/1877 in engineer’s log kept by Charles Hocken on CS Seine. 14. It is usual for ropes to be made with a right-hand lay, but when Glass, Elliot and Company started work they found that the normal stowage of the cable in a ship would tend to unwind the serving. Accordingly they decided on a left- hand lay, but nobody informed R. S. Newall of the change in direction. As one cable would have unwound the other at the mid-ocean splice, a special jig had to be constructed to absorb the counteracting strains. 15. And in this context, the following extract is relevant. It is by Willoughby Smith and taken from his paper ‘A resume of the earlier days of electric telegraphy’ which was read at an Extraordinary Meeting of the Society of Telegraph Engineers (later the Institution of Electrical Engineers) held in Paris during the Exposition Internationale d'Electricite, 21 September 1881. It relates to the Falmouth- Gibraltar cable of 1859. This cable was also coiled into water tanks as manufactured, but the ships engaged to lay it were not fitted with tanks, consequently soon after shipment of the first section an increase in the resistance of the conductor denoted an increase in the temperature of the cable, which was found to arise from fermentation, but whether caused by the hemp serving or the oxidations of the iron, opinions differed (no one appears to have considered the vegetable nature and content of the gutta percha). By thermo-electric measurements the temperature varied from 84 to 62° Fahr ... 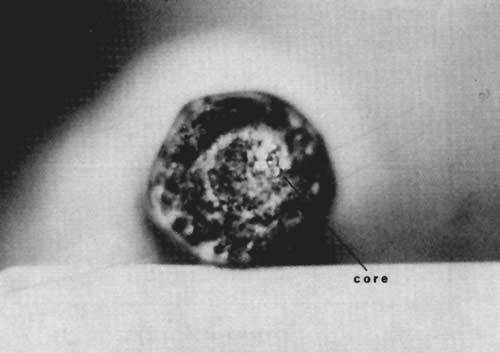 It was thought that the high temperature might have permanently injured the gutta percha, but a length of core taken from the hottest part showed no signs of deterioration. It would appear that people at that time were aware that fermentation was detrimental to cables, but nobody explicitly linked it with the 1858 Atlantic cable failure. 16. International Critical Tables, Vol. 2, p. 294. 17. The India Rubber journal, 8 April 1944, p. 393. The photographs below show the cable coated in marine deposits and tied down to a piece of old domestic lighting wooden conduit. 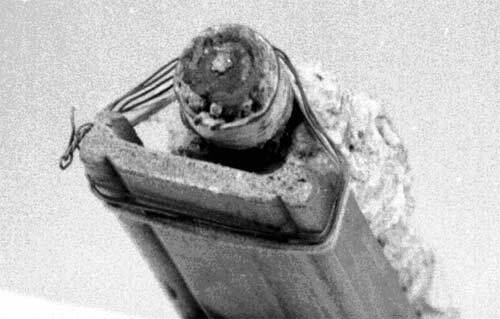 The top picture suggests that it is a sample of the cable that was manufactured by R.S. Newall. In the middle picture we see the serious distortion of the central copper conductor, while the bottom picture shows the other end of the sample. Observe that the core on this side although eccentric is still some distance from the outer armouring. W. Smith in his Rise and Extension . . . paper says that Halpin (commanding the Great Eastern) picked up some 1858 cable while attempting to repair the 1865 Atlantic cable some 568 nautical miles from Valentia island in 1869. However, there is some ambiguity here because it is believed that the cable that was manufactured at Birkenhead was taken westward by USS Niagara. However if this section had been produced in 1857 then it could have been taken on board HMS Agamemnon when cable was removed from storage after the1857/8 winter. There is a sad sequel to this research. Although a copy of the paper above, published in History of Technology in 1985, was presented to the misses Kent (Halpin’s grand-nieces), they obviously did not broadcast any information about the true value of this item that was in their possession. It would appear that following the death of her sister, Miss Louise Kent arranged for their home at Church Hill in Wicklow to be put up for sale with all effects (60 lots ) sold at auction. It seems that there was notice of this upcoming event in the Irish Times on 17 August 1991, but the cutting was not passed to me until long afterwards. On 7 September 1991 the same newspaper carried a further note to the effect that Mr Robert Guinness was setting up a museum at Straffan, Co. Kildare, and that he had acquired a piece of Atlantic cable at the auction. Despite vigorous enquiries the current whereabouts of this most revealing section of cable remains unknown.